Do you or your kids love Drawing? Well, it can be difficult to have pencil and paper everytime specially when you are on the road away from home. In such times, you still can spend your time by drawing on your Android Smartphone. Yes, there are many apps for Drawing and this article will help you find out some of the Best Drawing Apps for Android. Anyways, before getting started let me talk more about Drawing. Defining drawing is difficult. For some, it is a passion. For others, it is a pastime. Even for some, it is a profession, and they are good at what they do. Also, human beings have been drawing since before they even began to speak. That is why experts often discover caves where prehistoric human beings drew a lot of stuff on the walls. These drawings have been the only form of expressing one’s thoughts and ideas for very long. Well, of course, we have come a long way from drawing on walls. Drawing has got its fair share of upgrades from technology. Gone are those days when you had to throw away a drawing if you made a mistake while painting with colours. Now painters use software for creating and simulating drawings before making them. Most professional painters use high-end computers to simulate the effects of using various colours on their drawings. However, if you are looking for an app to help you with your favourite passion, you have come to the right place. These apps can help informally to draw and express your ideas whenever you want to. All you need is your smartphone and a powerful imagination. I have listed around 10 free drawing apps that you can start using right away. 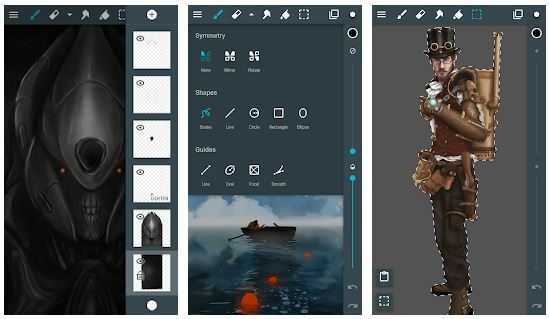 Here is a list of the best android apps you can use for drawing. Most of these drawing apps are free but may require you to upgrade in order to unlock more features. Artflow is one of the best apps used for sketching. The main noteworthy feature of this app is that it provides a huge number of brushes. To be exact, around 70 of them. While working on your drawing, you can also include beautiful features like smudging. After finishing your drawing, save it in any format you want. It is available for free on the play store. Click here to download artflow. This is one of the best apps available for painting or sketching. It includes various features like different pen tips, different drawing features, along with important customization features. Another important feature allowed b this app is that you can get up to 64x zoom. You can import other images or export finished images for sharing. The app is for free download and works best with cloud storage. Here is the download link for Adobe Illustrator Draw. This app is very good for sketching and drawing. It provides all the bells and whistles like a large number of brushes and features for drawing for comics also. However, the most important feature is that it allows cross-platform workspace. This means that you can work in android Windows and mac on the same creation. Do it where you feel comfortable. Naturally, this comes with an added feature of cloud storage. Here is the download link for MediBang Paint. This free drawing app is very fun to use. It features a ridiculously high number of brushes of different types. Another rather amusing feature of this app is that you can record yourself drawing. So now you have proof for boasting about that beautiful drawing you made! Draw on different layers in the same drawing. So this app supports detailed in-depth drawing. The app is available for free and has some in-app purchases. Here is the download link for Ibis Paint. This app is a bit different from the others. It lets you do pixel art. That means the drawing space is divided into a grid. Zoom into each pixel and fill it with a colour of your choice. When you are done, zoom out and see the complete beautiful picture. You can use it to draw almost anything you can think about. Here are some simple things to draw. Another important feature is autosave, so do not worry about saving it time to time. Export your work in any format you want. Click here to download dotpict. Autodesk is a prominent name in the word of designing both 2D and 3D. So it is no wonder that they also have an app for drawing. The app provides different features, like a huge number of brushes, large zoom, layers and different blending modes. You need an account in Autodesk to try out the app. Here is the download link for Autodesk Sketchbook. This app is popular because the images can get very close to real life. All the basic features like different brushes and layer drawing are present. What separates this app from the crowd is its tracing mode. Import any image and set it to translucent mode. Then you can trace from the image into your workspace. This can help in learning and create your dream photos more easily. This feature makes it the perfect apps for amateurs. The app is available free in the play store. Here is the download link for PaperDraw. This app is on our list because ironically it should not be here. This app is actually quite an app while considering it has been made by an OEM. The app provides all the basic features that a sketching app should. Also, it is a standalone app with no need to sign in. It is free with in-app purchases. Click here to download Sony Sketch. As the name suggests, this app is used for creating animations mostly. the concept is that you can create the animations frame by frame. When you are done, pack them together to make a small animation. Along with the usual drawing tools, you can also get some video features like resolution and frame rate control. Export completed pieces in the form of gifs videos or image sequences. You can get this app for Rs. 300. Here is the download link for Rough Animator. This app is as simple as it named. No frills, nothing unique. You can use this app to scribble small drawings on your mobile screen. maybe its simplicity is its biggest feature. It features some different colours though. Of course, it is available for free. Click here to download Simple Draw. Based on the above article, here is a list of all the free android apps for drawing. Thus we see that there are a lot of apps that you can use for drawing. I have named just a precious few among them. They might not be well detailed enough for helping you professionally, but they certainly can help you to make good enough drawing for your leisure. I hope you have enjoyed reading the article. Please do not forget to write about your thoughts in the comment section below.